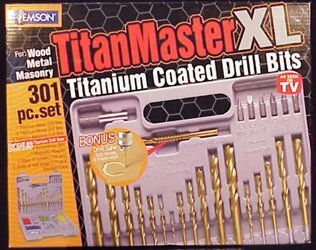 Titan Master XL Drill Set. If you look around the web, there is a problem with titanium drill bits. They are expensive, costing more than their weight in titanium! This means that the home diy person is going to have few titanium drill bits. Doing a job will mean making do with the drill bits they own rather than the correct drill bit. Necessarily, the job is likely to suffer. So how can the amateur have the benefits of titanium without drilling deep? Titan Master XL Drill Set text, images and video are copyright.